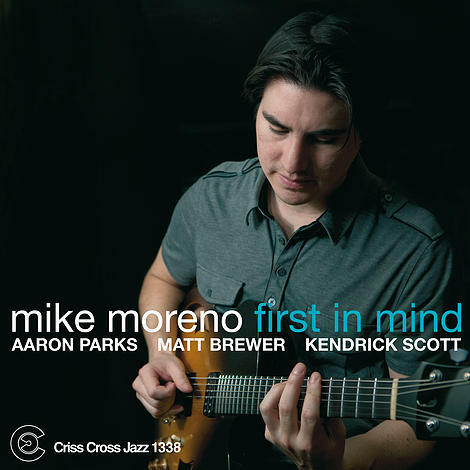 Following up his 2008 Criss Cross debut Third Wish (Criss 1303 CD) acclaimed guitarist Mike Moreno returns with another brilliant quartet outing, First in Mind. 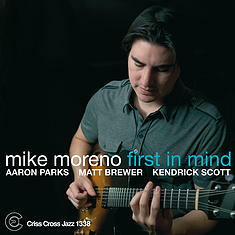 Bringing a flowing, centered tone and ceaseless improvisational ideas to the table, Mike offers a mix of jazz standards, compelling originals, and refreshing reinventions of modern repertoire (Sonny Rollins’s Airegin , Milton Nascimento’s Miracle of the Fishes , Joe Zawinul’s In a Silent Way ). Joined by the esteemed Aaron Parks on piano, Matt Brewer on bass and fellow Houston native Kendrick Scott on drums, Mike cements his reputation as one of the strongest guitarists on the New York and international scenes.